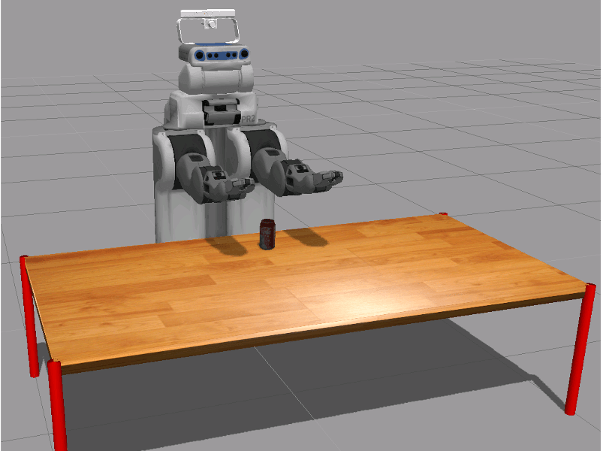 This example shows how to send commands to robotic manipulators in MATLAB®. Joint position commands are sent via a ROS action client over a ROS network. This example also shows how to calculate joint positions for a desired end-effector position. A rigid body tree defines the robot geometry and joint constraints, which is used with inverse kinematics to get the robot joint positions. You can then send these joint positions as a trajectory to command the robot to move. Spawn PR2 in a simple environment (only with a table and a coke can) in Gazebo Simulator. Follow steps in the Get Started with Gazebo and a Simulated TurtleBot to launch the Gazebo PR2 Simulator from the Ubuntu® virtual machine desktop. In your MATLAB instance on the host computer, run the following commands to initialize ROS global node in MATLAB and connect to the ROS master in the virtual machine through its IP address ipaddress. Replace '192.168.245.130' with the IP address of your virtual machine. Specify the port if needed. In this task, you send joint trajectories to the PR2 arms. The arms can be controlled via ROS actions. Joint trajectories are manually specified for each arm and sent as separate goal messages via separate action clients. Create a ROS simple action client to send goal messages to move the right arm of the robot. rosactionclient object and goal message are returned. Wait for the client to connect to the ROS action server. The goal message is a trajectory_msgs/JointTrajectoryPoint message. Each trajectory point should specify positions and velocities of the joints. 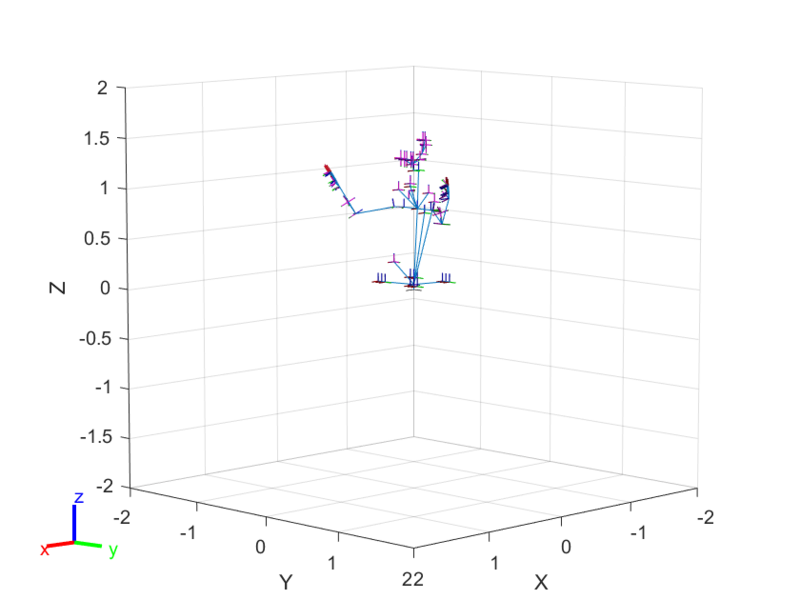 Create setpoints in the arm joint trajectory by creating ROS trajectory_msgs/JointTrajectoryPoint messages and specifying the position and velocity of all 7 joints as a vector. Specify a time from the start as a ROS duration object. Create another action client to send commands to the left arm. Specify the joint names of the PR2 robot. Set a trajectory point for the left arm. Assign it to the goal message and send the goal. In this section, you calculate a trajectory for joints based on the desired end-effector (PR2 right gripper) positions. The robotics.InverseKinematics> class calculates all the required joint positions, which can be sent as a trajectory goal message via the action client. 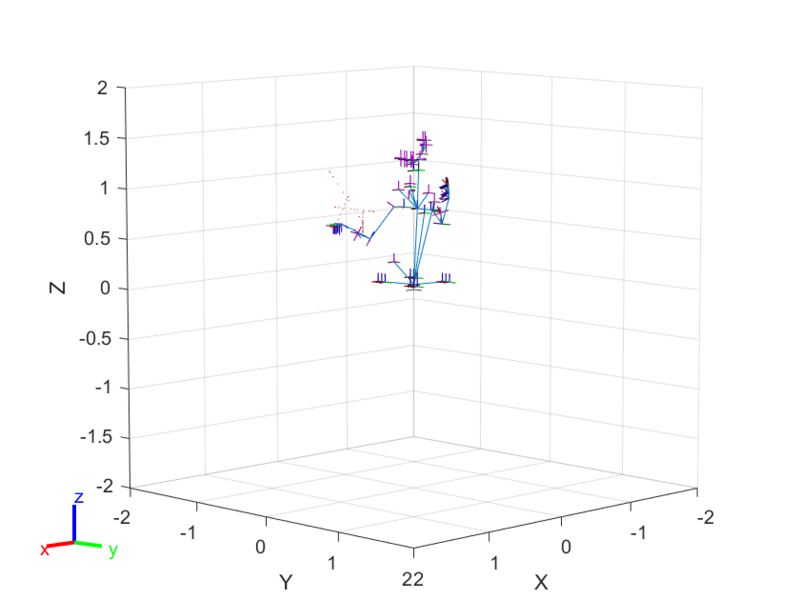 A robotics.RigidBodyTree class is used to define the robot parameters, generate configurations, and visualize the robot in MATLAB®. Get the current state of the PR2 robot from the ROS network and assign it to a robotics.RigidBodyTree object to work with the robot in MATLAB®. Define an end-effector goal pose. Visualize the robot configuration using these joint positions to ensure a proper solution. Use inverse kinematics to calculate joint positions from goal end-effector poses. Send the trajectory of joint positions to the ROS action server to command the actual PR2 robot. Load a PR2 robot as a robotics.RigidBodyTree object. This object defines all the kinematic parameters (including joint limits) of the robot. Create a subscriber to get joint states from the robot. Get the current joint state message. Assign the joint positions from the joint states message to the fields of a configuration struct that the pr2 object understands. Use show to visualize the robot with the given joint position vector. This should match the current state of the robot. Create an robotics.InverseKinematics object from the pr2 robot object. 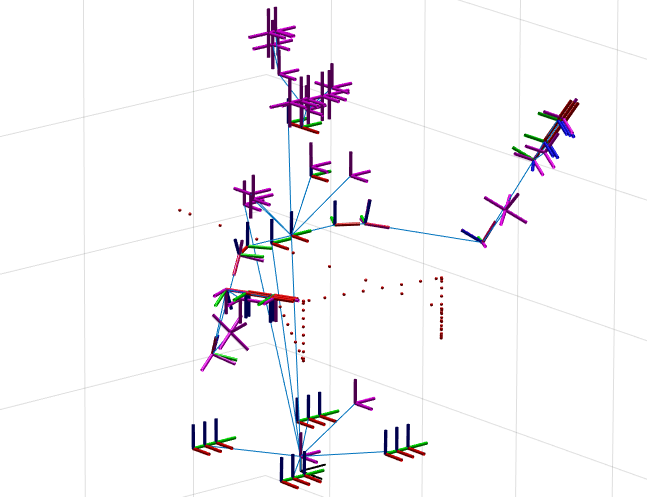 The goal of inverse kinematics is to calculate the joint angles for the PR2 arm that places the gripper (i.e. the end-effector) in a desired pose. A sequence of end-effector poses over a period of time is called a trajectory. 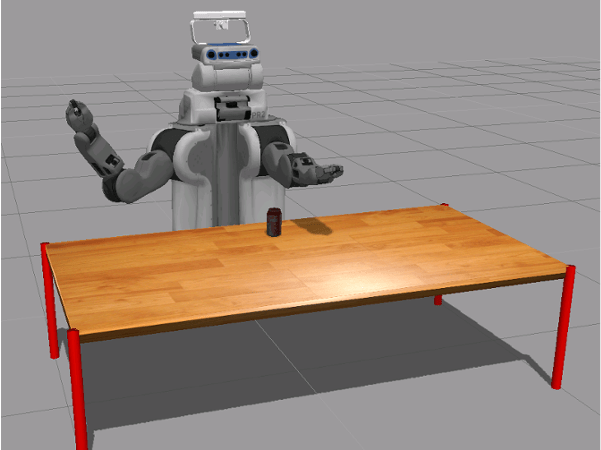 In this example, we will only be controlling the robot's arms. Therefore, we place tight limits on the torso-lift joint during planning. Disable random restart to ensure consistent IK solutions. Specify weights for the tolerances on each component of the goal pose. Specify end-effector poses related to the task. In this example, PR2 will reach to the can on the table, grasp the can, move it to a different location and set it down again. We will use the InverseKinematics object to plan motions that smoothly transition from one end-effector pose to another. Specify the name of the end effector. Specify the can's initial (current) pose and the desired final pose. 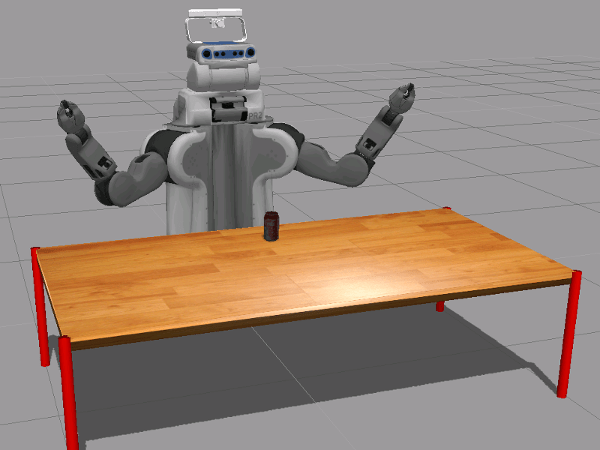 Define the desired relative transform between the end-effector and the can when grasping. The actual motion will be specified by numWaypoints joint positions in a sequence and sent to the robot through the ROS simple action client. These configurations will be chosen using the InverseKinematics object such that the end effector pose is interpolated from the initial pose to the final pose. Specify the sequence of motions. Execute each task specified in motionTask one by one. Send commands using the specified helper functions. Move arm back to starting position. Call rosshutdown to shutdown ROS network and disconnect from the robot.